DVD Vol.1: Leg Targets, Kyusho Take-Downs, Tuite, Weapon Defense... all from Kata postures and actions. The Philippines has a long history of life and death combat. From ancient times to the modern day, the fighting arts of the Filipino archipelago have proven themselves time and again to be efficient, effective and extremely deadly forms of fighting. There are countless systems of Filipino martial arts spread throughout the thousands of islands in this region. Many are family arts and no "outsider" will likely ever learn them. Fortunately, many have also been made available to the rest of the world. From the Kyusho perspective the study begins with learning revival and restorations, but then develops mobile arm targeting as its Martial foundation. When you dissect an attack, besides a kicking action, all other attacks start with the arms, but the challenge is that the arms are the fastest moving parts of the body with the greatest range of motion and directional attack capability. So it is a very challenging section of training that should be integrated into every session, in so many variations. There are other ways to make this level a bit easier and one is in the skill of Arm Trapping. Kali Master Raffi Derderian and Kyusho Practitioner Evan Pantazi - a collaborative film. This is the first edition of this new DVD Languages included in DVD: English, Español, Français, more to come... This includes the Kyusho International Shihans during the filming, performing several arm KO's. Kali is a very versatile and old system of fighting that includes empty hand as well as weapon training methods. It is a devastating Art unto itself, but when you add the Kyusho you become even more efficient, effective and advanced in disabling an opponent. Kali has always taught what is called "Gunting" for strikes to weaker aspects of the arms, in volume #1 the Kyusho added even greater potential and a perfect starting point for the Kyusho or Kali practitioner. Many arm destruction methods were demonstrated as well as Kyusho Knockouts using only the nerves of the arm. 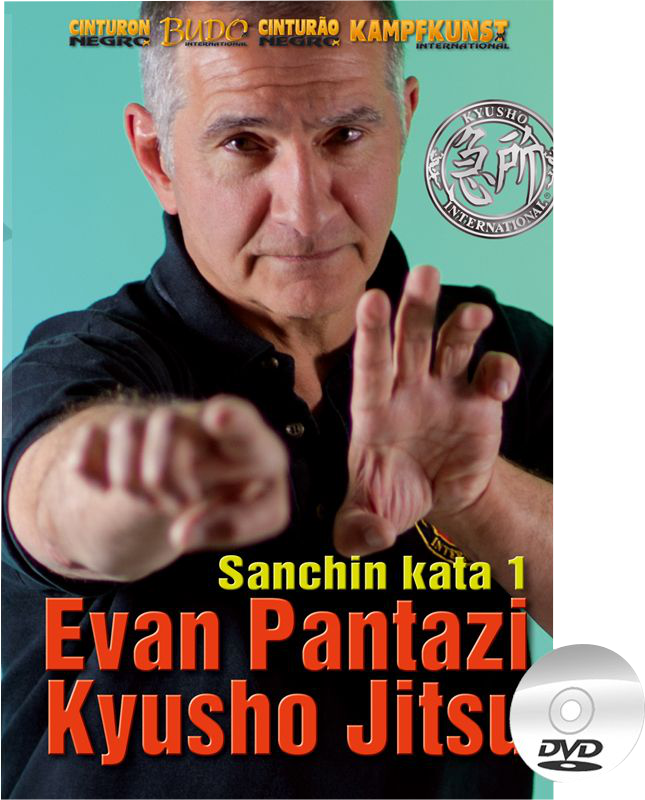 This second volume expands on these powerful Kyusho targets by working from the arm traps of volume #1 and demonstrating additional and even more powerful head targets for incapacitation of the opponent. This video compilation will bring you far more advanced skills, even if you do not practice Kali... the two methods were meant for each other. Several KO's are demonstrated so you can see the efficiency and affect Kyusho brings to Kali. Or get both €45 ... and save 20! Many thanks for the DVD Evan. Took a quick look yesterday and was most impressed with the quality. I am enjoying your new dvd. Lots of great techniques and information in it. I'll be sending out a newsletter to my mailing list this week, promoting the dvd. Kyusho Self Protection - the second level in this profound 3 part series using Kyusho for a simplified self protection method for Women. In the second level build from the first, but for this production we used a novice to better illustrate the simplicity and power of self protection with Kyusho. This level includes the same targets and weapons along with new targets and weapons geared to handling increased stress and confinement of attack or situation. This escalates the urgency, intensity and allows the participant to experience the limitations of the adrenaline rush. This poses a more difficult range of motion and timing, as well as adding a more immediate and personal attack feeling. Restriction of normal clothing... and more. This should be your first purchase... if you are studying Kyusho. This is the final DVD for the Kyusho Curriculum series that not only shows the revivals but also how they came about, with live demonstrations to duplicate the physical dysfunctions and KO's, with the First Aid revival actually applied. This is the first information like this released (techniques developed by Evan Pantazi over the course of his Kyusho career), that should be a must for EVERY Kyusho practitioner. It digs deep into the study of Kyusho and will give you a new and unique perspective on this powerful art/science. This is also where the Kyusho Health & Wellness (health remedies), sprang from and the reason they are so effective and immediate. They were born of necessity, urgency and the reversal of dysfunctions perpetrated on a human body with induced stresses. This volume is absolutely my favorite of the 18 DVD set and begins your training with new possibilities and awareness. These DVD's are in a set curriculum and are taught in a step by step process so you learn fully and to the highest level of skill! DVD's are in English, Spanish, Italian, French and German Languages! Kyusho.com is now offering payment in Bitcoin! Our first deal is a Full DVD Set - Full 19 DVD set Plus special gift, regular price $641 plus shipping = $699. Special buy now with Bitcoin for only $499 (and no shipping charge), you save $200! And you get a special free gift! "Vital spot in Taekwon-Do is defined as any sensitive or breakable area on the body vulnerable to an attack. It is essential that the student of Taekwon-Do has a knowledge of the different spots so that he can use the proper attacking or blocking tool. Indiscriminate attack is to be condemned as it is inefficient and wasteful of energy". - General Choi Hong Hi (최홍희), ENCYCLOPEDIA OF TAEKWON-DO, Volume II, page 88. The founder understood well that even the so called "Blocks" were actually tools for attacking the weaker anatomical structures of the opponent. Techniques of attacks on pressure points are called "Kupso" (급소) in Korean martial arts ((Kyusho Jutsu (Japanese: 急所術)) they were an integral part of General Choi's Taekwon-do but long forgotten, now with the mutual agreement with Kyusho International, it will once again be. His surviving son Choi Jung Hwa, current President of the International Taekwondo Federation (ITF) is now working with us integrating Kyusho with ITF technique getting back to the founders omitted applications. No longer is Kyusho disbelieved by most, no longer is it just for outsiders, a similar paradigm that we share with Taeknown-do. Many Martial Artists have badmouthed TKD as well for decades due to it's sport tendencies, just as Kyusho has been forit's unbelievable power, affect and efficiency. But both are not only viable, they are strong, undeniable Martial entities and we are proud to link arms with the ITF and all Taekwon-do practitioners around the world to bring back the founders original art. The curriculum is set and is the start of a worldwide dynamic, Kyusho will eventually be in all Martial Arts and also not in the too distant future, that is the goal that Kyusho International has set and is accomplishing. Or Click Here for Instant Access - $29.00 (save Shipping)- Click Here! Anatomy of a Hook Punch - (circa 1999)Filmed for a Black Belt Magazine Video Shoot, depicting 8 Head points that will drop the opponent with a single punch.This video was a huge success that brought attention and focus to the simplicity of Kyusho and the controversial view that TMC, Elemental Theory, or Multiple Point applications were actually not necessary.Heresy! Kyusho Grappling - (circa 2000)Kyusho applications that greatly enhance your Grappling capabilities.Again this video was another landmark production which opened Kyusho for ground fighting applications, not yet explored in the Kyusho World. Again this production illustrated that Kyusho was simple and that single points without elemental theory or convoluted techniques were also completely affective in this range and style of combat. Innovative! Kyusho Basic Knife Method - (circa 2001)The way to use Kyusho against the bladed weapon to minimize stress and serious injury.This video again broke new ground as it clearly illustrated multiple point targeting in fast spontaneous motion. It also was first to break into the legal ramifications that Kyusho or even Martial Arts bears when used. as well as the traditional understanding that you needed to be defensive or that you need to disarm the weapon. Revolutionary! Mu & Shu Points - (circa 2003)The more advanced points of the body and their affects.This video was the first video (or for that matter any medium), that covered the more dangerous points on the human body. Never before were the points of the spine ever taught and it caused great concern, disgust and scathing reprimand from the Kyusho community for releasing this information publicly. Scandalous! They will be added to the http://learn.kyusho.com website soon.